We all have that dream kitchen in mind with like a zillion inspiration pictures to support it…..for that one day when dreams become reality. But for most of us, that dream might take longer than we would like. Plus, by the time we get that dream kitchen, there will be new upgrades and inventions that have replaced our awesome ideas. Ring any Bells? 12 Kitchen Upgrades (You Can’t Live Without). So, until that day, why can’t we add some upgrades to our existing kitchens right now? We’ll get a little taste of what is really important to us, and know what works best and what doesn’t work at all. So let’s get to the 12 incredible, jaw -dropping kitchen upgrades that will have you drooling….. the ones you just can’t live without 😉 If you’re joining me from 15 Easy Solutions- Kitchen Organization 2018 or Get House Organized: Top Ten List, welcome!! Want more kitchen inspiration try Opening up Kitchen Wall to Living Room or Opening Kitchen Wall to Dining Room. Cooking utensils have a way of cluttering up a drawer very quickly. To avoid this, use an existing cabinet or drawer and have it turned into storage for utensils, measuring cups, bowls, etc. Use crock/canisters for frequently used utensils in an upper tier shelf & store other supplies in lower tier shelves. The canisters make grabbing utensils much easier and the drawer ensures that all clutter stays hidden under your counter. Attach a wooden cutting board with a hole cut out to an existing drawer, or use it as a pull out shelf (all by itself). The key is to make sure it is installed over a pull out trash can – like picture below. The hole is a great idea so that you can wipe peelings & other scrapings directly into the trash can. Can’t get any easier than this!! Use these hinged cabinets to hide appliances you use everyday, or ones you leave out on top of the counter. These work much better than cabinet doors, drawers, or the roll down bread bin versions, and still keep counters from looking cluttered. You can attach a pull out shelf also to gain additional surface space. Instead of cabinets and/or hinged doors to store supplies under the sink, try using drawers. You won’t have to worry about products falling down on each other, and you’ll be able to see all of them at one time. Use a u-shaped drawer to go around the dimensions of the sink. Use a small drawer for items like sponges and brushes and a large drawer for detergent and cleaning supplies – genius!! We can’t forget about our furry friends either. Use a larger pull out drawer for food, toys, leashes, etc….and a smaller drawer for food containers/bowls. Both designs can be pushed back in (under the counter) when not in use and helps to keep walkways clear. Plus, all of their goodies will be stored in one place. Store spices under the counter in small or medium sized pull outs for easy accessibility. You can have this installed right by your stove so you don’t even have to leave your area while you’re cooking. You can also store a ton of spices and other products in pantry doors. 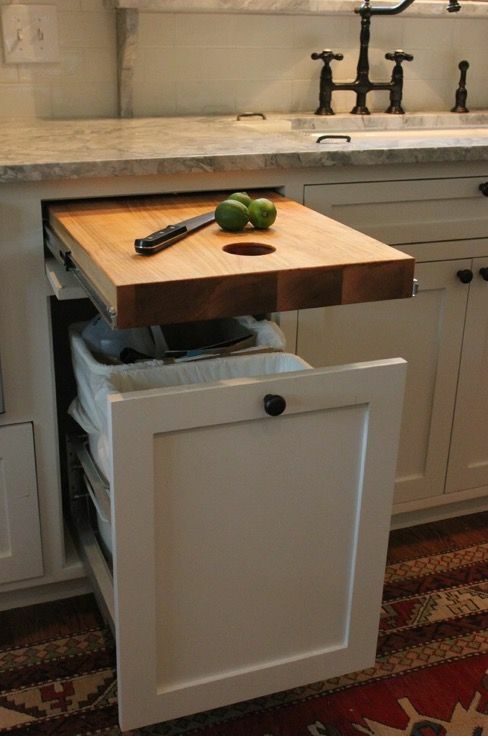 This definitely will save space in the kitchen by freeing up cabinets and drawers. These are becoming more popular and important than kitchen appliances- LOL!! 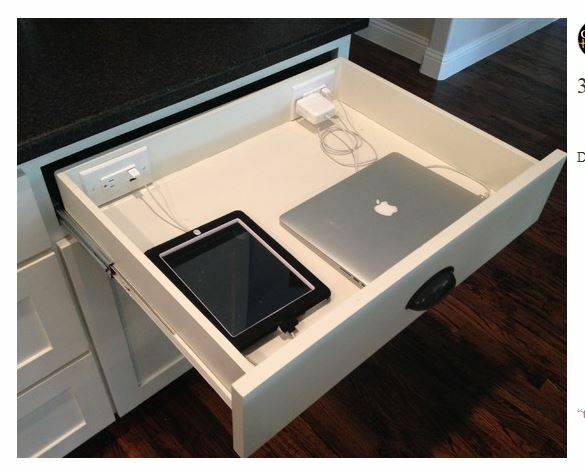 Designate a drawer and have electrical sockets added for computers, phones, i-pads and more. Use it with or without partitions depending on what works best for you and your family. Choose an area in the kitchen that can handle a lot of traffic. These are something else!! The hinged shelf goes from under counter storage to out of cabinet shelf (and work center). The shelf fits onto very sturdy hinges so that it can hold the weight of heavier appliances, and then pops up to create additional work space. They can be designed with or without an extra storage bin underneath (see picture to the right). Use a pull out shelf for the area at the bottom of the cabinet for additional appliances. Use unused/wasted space under cabinets with toe kick drawers for storing items that can lie flat. Have them installed with pressure sensor (toe touch) so that you can release drawers for easy access. These work great in smaller kitchens or when extra storage space is needed. Use the space under upper cabinets for more than just lighting. Cookbooks, tv’s, & charging stations work well on hinged devices, and lighter items like spices, measuring cups, & mail work in racks or bins. Try storing knives in pull out drawers to keep them out of little one’s reach. Don’t like to see clutter? Try the hinged design, or pull out shelf. Coffee built in – I love this built in coffee unit with pull out tray for coffee fixins. What a genius idea so you can save much desired counter space, and you don’t make a mess with sweeteners and creams. Microwave Drawer – How did we live without this? This is a great idea for the trending under counter microwave craze. The drawer makes it easy to drop things directly into it, instead of bending down and breaking your back to put things into it. Plus, you will save space by not having the swing door option. This saves a lot of room in a cramped kitchen. Wine fridge – Add a wine fridge to a beverage station or to kitchen island. They give the kitchen a modern look, and a more custom feel. You can also add a wooden wine rack built in to keep your “extra” bottles in – LOL!! What do you think….which one is your favorite? My favorite is the coffee station because I LOVE my coffee, but we are adding the microwave drawer for function (of course), spice rack pull out, and electronics charging station. I also love the utensils in the canisters pull out drawer- such a genius idea. Let me know which one you try – I’d love to hear from you! !